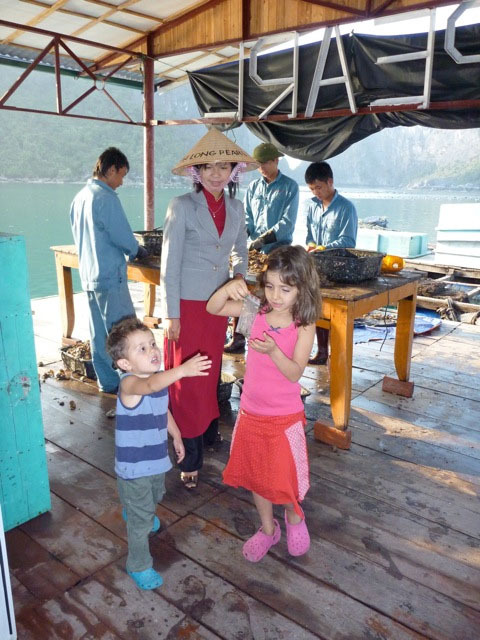 Zoubir and I made a stop to learn more about cultured pearls while cruising these dazzling waters with our two children in Vietnam. Before the 20th century, the only way to get this form of deepwater “gold” was to dive deep into the waters with primitive diving gear, bring up a handful of oysters, and hope you get lucky. Today most pearls are cultivated, which makes them a lot more accessible. The farmers of Vietnam Pearl Company live in floating houses onsite where they hatch, graft, and clean the Akoya oysters. The quality of the oyster will affect the quality of the pearl. To cultivate the pearl, they open it just enough to insert a hard-shell bead and mantle tissue from an oyster that has produced a high-quality pearl in the past. Cultivation takes between 10 to 18 months. And the results are truly stunning. After the pearl farmers patiently showed us this process, our conversation turned to the kids–probably because mine were having a contest to see who could get closer to the water’s edge, a game which I was obviously less than thrilled about. One lady was pregnant and planned to raise her baby on the floating farm. Her husband transported the pearls and came by boat every couple of days. As I shadowed my three year old to keep him from falling off the wooden planks, I could only imagine trying to get any work done with a toddler while living on this floating farm. But she seemed to take it in stride. She quietly sifted out two tiny crabs from among the oysters and packed one for each child into a little plastic bag. My children were mesmerized. 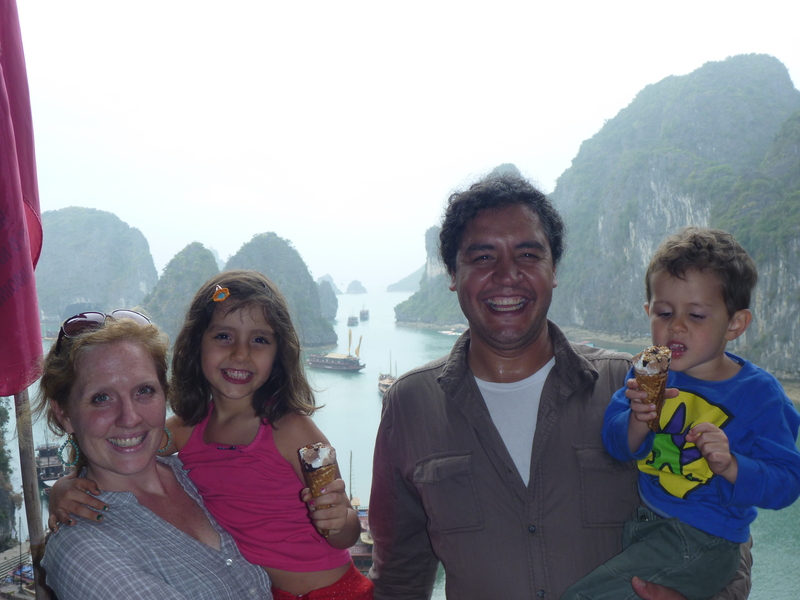 They were more pleased with their small treasures than had we left with a handful of pearls. As for me, I wouldn’t have minded a $6,000 strand of perfect grey pearls…Didn’t get it, but I certainly am feeling inspired to use more pearls in our KTCollection spring line. My what an experience ! Luv the photos and information. Well done. You all look so relaxed !